Very often, T-shirts are made from preshrunk cotton, making them perfect to toss in the washer and dryer at a moment’s notice. T-shirts usually feature a soft and snuggly jersey cotton type material, making them comfortable and nice to wear even when you aren’t feeling the greatest. 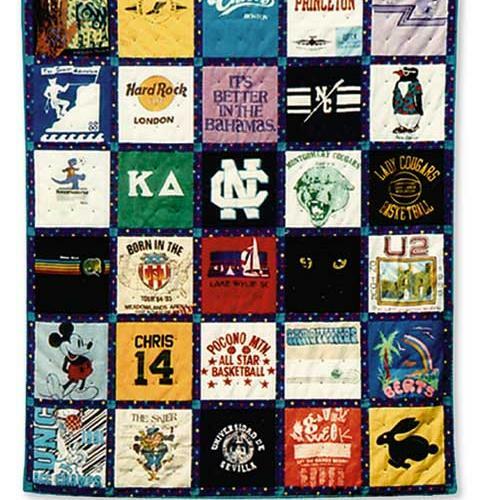 The combination of being comfortable and easy to wash make t-shirts a great candidate for creating a keepsake quilt. To create your very own keepsake t-shirt quilt, follow the FREE tutorial. You may need to brush up on some sewing and quilting techniques if you are a beginner. You can also refashion or restyle your old t-shirt with this FREE Sewing Tutorial.